Posted on February 22, 2011 by Jill B. Bigger, better security for flash drives is all the rage in today’s market, but the question is—what do we really need to keep our data safe? 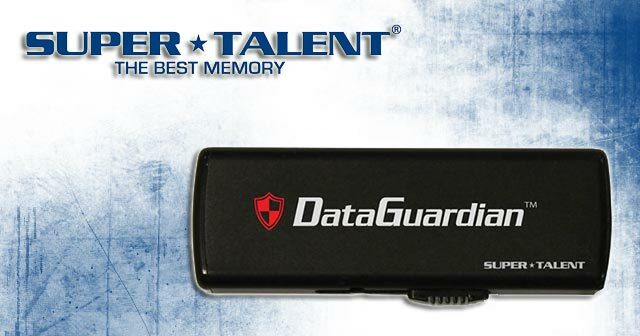 I recently had the chance to chat with Super Talent exec Peter Carcione about what makes the new password protected DataGuardian USB drives stand out. Carcione brought to light some unique insights that could redefine flash drive encryption for the everyday consumer. A majority of flash drives operate in a secure user mode that is intended to protect your device from malware lurking in public computers at libraries, copy shops and the like. However, without admin rights, these flash drives are increasingly frustrating to use, limiting users from printing or accessing certain files and applications. On the other hand, many hardware encrypted USB drives will restrict ease of use through complex partition management, application installation and administration rights. As a result, the DataGuardian USB drives rely on consumer-grade security rather than 256-bit AES encryption that you’d find in a product like IronKey. If it’s not top of the line hardware security, is it worth it? More importantly, is it enough protection? Carcione says that flash drive users should have the security that’s appropriate for the kind of data they’re trying to protect. Most of us are not keeping high-profile government secrets on our flash drives. Why buy a $400 lock for data that’s worth closer to $100? He says you don’t need the most high-tech hardware encryption to keep your data safe; you simply need to lock access to the USB drive itself, which is a function that the DataGuardian is built for. Carcione even assured that if you unsoldered the data chip and put it on another drive, no other user could hack into it. The DataGuardian also protects against AutoRun malware. Even if your flash drive has an infected file, it will not go on to infect the rest of your computer. “Because of the way the DataGuardian launches, it will defeat every malware attack. It will overwrite your overwrite once you plug it back in. I can’t think of a way to defeat it,” Carcione said. The DataGuardian boasts a black metal exterior with a slide-out connector. It uses USB 2.0 connectivity and is now shipping in 4GB, 8GB and 16GB capacities. Carcione hinted that a USB 3.0 version could be ready sometime in the spring. Prices are user-friendly too. As a comparison, an 8GB DataGuardian sells for about $19 while an 8GB IronKey sells for $97. Running from firmware and requiring zero configurations, the DataGuardian is protected from the first time you plug it in. From there, a simple window pops up to create your own unique password. Thoughts on the DataGuardian USB drive? Does consumer-grade security fit your needs or do you think the more complex encryption management of other flash drives is worth the extra time and effort? This entry was posted in Articles, Super Talent Technology, USB encryption, USB Flash Drives and tagged Data Guardian, DataGuardian flash drive, DataGuardian USB drive, Flash Drive Encryption, flash drive security, Iron Key USB flash drives, Super Talent, Super Talent DataGuardian, USB 2.0, USB drive, USB Flash Drive, USB Flash Drive Encryption. Bookmark the permalink.